Los creadores del metodo preuniversitario Peruano , han decidido volver a reunirse para dar a conocer los resultados de sus investigaciones a la fecha, y evitar que todo nuestro esfuerzo se pierda . Las academias preuniversitarias, colegios preuniversitarios, grupos de estudio preuniversitarios y centros preuniversitarios utilizan nuestro metodo actualizado hasta el año 1980 en que dejamos de aportar. 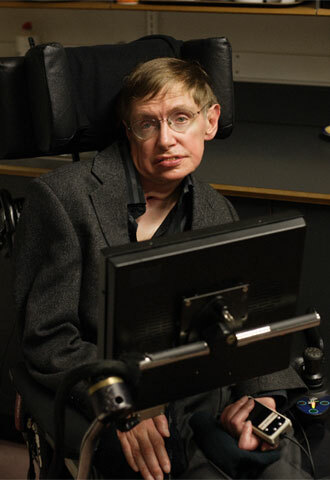 1.-Articulo de STEPHEN HAWKING: ¿Juega Dios a los dados? 1.- "I have noticed even people who claim everything is predestined, and that we can do nothing to change it, look before they cross the road." 2.- "We are just an advanced breed of monkeys on a minor planet of a very average star. But we can understand the Universe. That makes us something very special." 3.- "I think computer viruses should count as life. I think it says something about human nature that the only form of life we have created so far is purely destructive. We've created life in our own image." 4.- "All the evidence shows that God was actually quite a gambler, and the universe is a great casino, where dice are thrown, and roulette wheels spin on every occasion"
5.-"When one's expectations are reduced to zero, one really appreciates everything one does have"
6.- "The whole history of science has been the gradual realization that events do not happen in an arbitrary manner, but that they reflect a certain underlying order, which may or may not be divinely inspired." 7.- "I have hardly ever known a mathematician who was able to reason"
8.- "Not only does God play dice, but... he sometimes throws them where they cannot be seen." 9.- "To confine our attention to terrestrial matters would be to limit the human spirit." 10.- "It matters if you just don't give up"
11.- "My goal is simple. It is a complete understanding of the universe, why it is as it is and why it exists at all." 12.- "It is not clear that intelligence has any long-term survival value"
13.- "If we find the answer [the unified theory], it would be the ultimate triumph of human reason -- for we would know the mind of God." 14.- "The usual approach of science of constructing a mathematical model cannot answer the questions of why there should be a universe for the model to describe. Why does the universe go to all the bother of existing?" 15.- "Even if there is only one possible unified theory, it is just a set of rules and equations. What is it that breathes fire into the equations and makes a universe for them to describe"
16.- "Someone told me that each equation I included in the book would halve the sales." 17.- "There are grounds for cautious optimism that we may now be near the end ofthe search for the ultimate laws of nature". 18.- "It is no good getting furious if you get stuck. What I do is keep thinking about the problem but work on something else. Sometimes it is years before I see the way forward. In the case of information loss and black holes, it was 29 years." 19.- "If we do discover a complete theory, it should be in time understandable in broad principle by everyone . . . . Then we shall all, philosophers, scientists, and just ordinary people be able to take part in the discussion of why we and the universe exist." 20.- "God not only plays dice, He also sometimes throws the dice where they cannot be seen." 21.- "I put a lot of effort into writing A Briefer History at a time when I was critically ill with pneumonia because I think that it's important for scientists to explain their work, particularly in cosmology. This now answers many questions once asked of religion." 22.- "Marilyn. Newton seems to have been an unpleasant character." 23.- Most sets of values would give rise to universes that, although they might be very beautiful, would contain no one able to wonder at that beauty." 24.- "The old paradox: Can God make a stone so heavy that he can´t lift it?" 25.- "When asked, 'What did God do before he created the universe?' St. Augustine didn´t reply, 'he was preparing Hell for people who asked such questions.' Instead, he said that time was a property of the universe that God created, and that time did not exist before the beginning of the universe." 26.- "However, one cannot really argue with a mathematical theorem." 27.- "Intelligence is the ability to adapt to change."